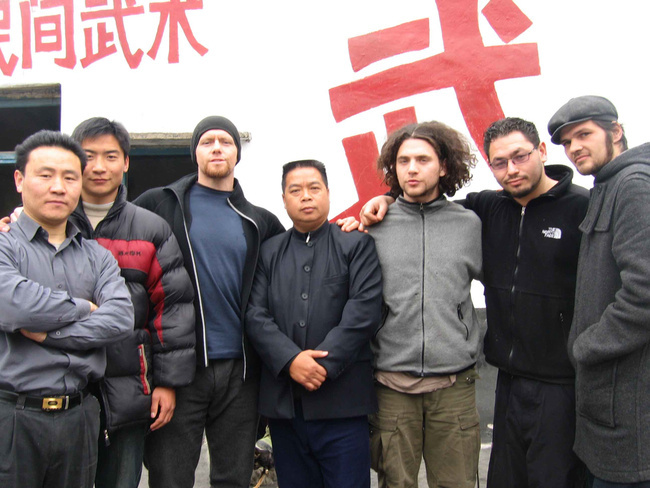 My first contact with Chinese martial arts was in 2003, in the hallway of a cold concrete apartment in Chengdu. Shifu Li Quan had brought his master down from the mountains, and he invited his foreign buddies to come and meet him. Master Dai Kang—or Shiye, as I came to call him (the shifu of your shifu is your shiye)—was a short man, with a compact, solid build. His jet black hair shot straight up from his forehead, and he had on a blue Mao suit with the top button open. He looked like a cleaned-up farmer. I learned that Shiye had won a provincial competition earlier that year for his performance of a martial arts form called 36 Elbows—as soon as I heard the name of the form, my interest was piqued. I wanted to see it. When I asked Shiye to perform it for us, he just laughed at me while the rest of the students at the table shifted awkwardly. I realized somewhere in the back of my head that it was inappropriate for him to whip this form out for a gawking foreigner, but I still wanted to see it. The form sounded esoteric to me, and yet brutal and dangerous. It conjured up the Wu Tang Clan, dubbed samurai movies, and smashed faces—everything a Western kungfu pilgrim could hope for. Shiye never showed me the form, but his prodigal student, Li Quan, did. The first time I saw the full form, I knew it wasn’t just a pretty movement for competitions, but a collection of effective combat techniques, perfect for inside fighting and dirty boxing. Watching Li Quan explode across the floor a decade ago, throwing sharp elbows with every step, colored my impression of Chinese martial arts forever. 36 Elbows is a Southern Fist kungfu form, popular all over southern China in what is known as 民间功夫, or the “common people’s kungfu,” which basically means kungfu schools unaffiliated with any of the major temples or big name kungfu brands. This is an important distinction to make, because Li Quan and Shiye always distanced themselves from the big names—like Shaolin, Wudang, or even lesser known styles like Emei mountain—because those styles had succumbed to commercialization, or been ravaged by repeated purges. For them, only the common people’s kungfu was “real kungfu,” a stripped down martial art focused on useful techniques designed not for show, but for combat. There are several requirements for someone to effectively use 36 Elbows in combat, the most important being powerful, flexible hips and a low stance. Power comes from twisting the hips and the spine, while gripping the floor with a solid, balanced stance. 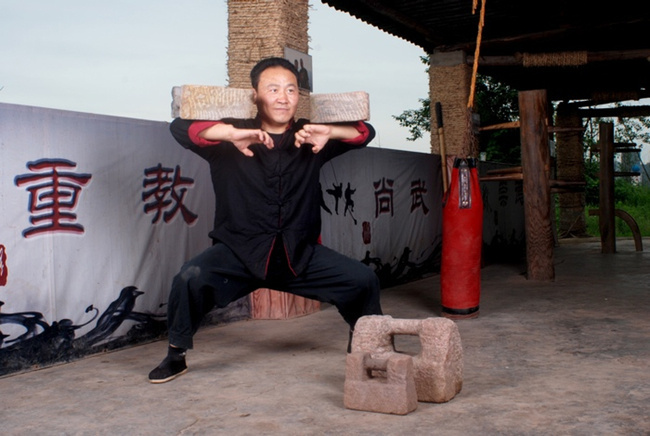 Most stances in Chinese martial arts rarely square up, with the emphasis on providing the opponent with only the smallest of targets. If the stance is correct, then footwork and elbows move in tandem, and there is never the risk of overreaching. For a Southern Fist practitioner, nothing is more dangerous than reaching over his feet, thereby losing his center of gravity and with that all of his power. While most of the world’s fighters snort at the idea of kungfu in the ring, I hold on to my belief that the Chinese martial arts have concrete techniques to contribute to mixed martial arts, not just poetic phrasing and cool stories. People humor me for the most part, I think, because a lot of martial arts enthusiasts would love nothing more than to make a connection between the storied lore of Chinese martial arts and the proving grounds of mixed martial arts. The only way to bridge the disconnect, however, is to throw the lore into the ring. 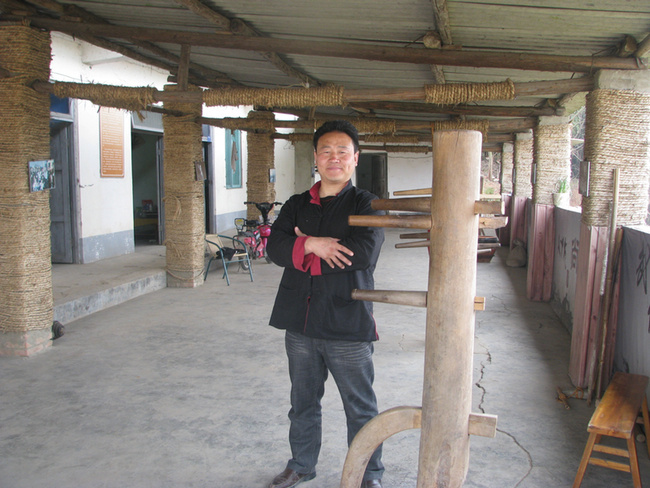 So I went to visit Li Quan at his school outside of Chengdu, in a concrete farmhouse on the edge of a village called Flower Town, to ask him for help breaking down each movement from the 36 Elbows form into its component parts. He came up with eight strikes and eight blocks that form the core attacks and defenses. I’ll leave it up to the Reader, and those who actually fight in the ring, to determine if any of the following is useful in combat. Elbow strikes are now some of the most utilized weapons in MMA. Step in elbows, elbows in the clinch, ground and pound elbows ... all can be devastating if they make contact. The strikes below are a few gleaned from the “Mother of Elbows” movement that represent some of the basics. To land this strike, you have to step in and close with your opponent, and either land a short uppercut elbow to the chest and gut area, or you can turn your arm horizontally and shove your opponent. The phrase for this strike is 金刚撞钟, or “the monk strikes the gong.” Many Shaolin monks have become deities of a kind over the years, and the monk referred to in this phrase is one of those, named Jin Gang, or Golden Rod. This is most likely an illegal strike in Unified Rules. It involves leaning out in the bow stance and chopping down on an opponent. The elbow strike actually circles up and then comes down. 童子劈山, “the child chops the mountain” describes this strike—but this is no ordinary child. The phrase comes from a story of a child who chops a mountain in half in order to retrieve his buried mother. This is Southern Fist dirty boxing. With this strike, you roll your shoulders forward, and strike with the edge of the elbow. When demonstrated for me, this strike consisted of several rolling, downward strikes in succession, right down the middle of the pipe at someone either very close in on you, or coming forward aggressively. The phrase for this move is interesting, 翻江倒海, which means “flip the river and roll the sea,” conjuring up roiling seas and crashing waves, which is what a series of rolling elbow strikes should resemble. Elbows can be brutal in defense as well, especially when blocks are actually defensive strikes. For example, an elbow can strike at a jab, or a straight right and not only deflect the punch, but inflict a bit of damage on that arm. Several accurate elbow strikes to an arm can drain the punching power real quick. Also, most defensive moves lead directly to attacks, either strikes or through pinning the arms down. The moves below involve a bit of everything, including basic blocks and “grip-breakers” in which a short, explosive elbow strike is meant to break an opponent’s hold. The Chinese phrase 魁星献斗, “the martial god proffers the platter,” is for a similar yet different movement, in which someone attacks from the front, gripping behind your neck. Here, you do not drop in your stance, but instead strike upwards from your waist with an elbow strike meant to drive through the opponent’s hold, and up into his chin. This is an interesting move. Here you throw one or both arms forward in a rising motion, right down the middle of the pipe. The move is meant to break holds, block overhand rights and hooks, and also allow for elbow strikes to the middle and upper section of an incoming striker’s arm. The phrase for this one is pretty cool: 霸王观阵, “the general surveys the battlefield.” But “the general” doesn’t do this particular person justice—the 2nd century BC Chu Kingdom’s Xiang Yu, known as Ba Wang, was a fierce general known for his kungfu skills and aggressive nature. In typical Chinese fashion, Xiang Yu was defeated by Liu Bang’s clever ploys, and committed suicide rather than escape with his life. This is a cover-up move, similar to the double-forearm defense seen in boxing. The Chinese phrase for this move is pretty straightforward: 罗汉把关, “the monk shuts the gate.” This phrase refers to another Shaolin monk, known as Luo Han. This is similar to what Jon Jones was using against Texeira. Stepping in and wrapping up his opponents arms, pinning them against his own ribcage and then torquing outwards. In 36 Elbows, the form ends up with both elbows meeting in the middle, wrapping and pinning two arms. The Chinese call this 双龙聚会, “two dragons call a meeting,” but in combat, one dragon suffices. This move is a side step to avoid a kick or a low punch, while striking with the flat side of the elbow across one’s own body, thereby blocking a kick or a low punch, and allowing for a quick transition to attack. This and the following block are standards in Southern Fist-influenced martial arts. One phrase that describes this movement is 韦陀拦門, “the monk bars the door." Another Shaolin monk, this one called Wei Tuo. 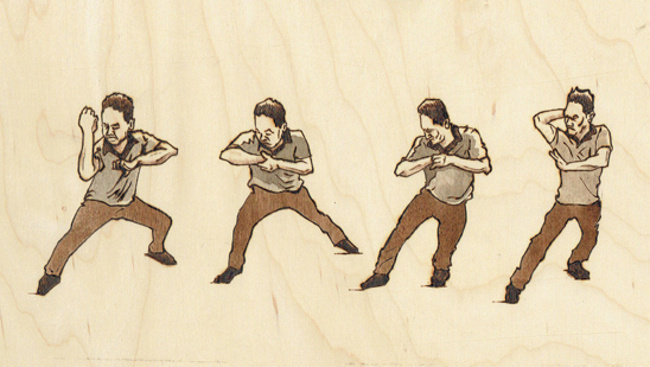 These are the 16 strikes that Shifu Li Quan determined as the basics. He has also written a detailed manual for each individual strike, with an emphasis on real fighting. Some of the techniques briefly outlined above are already in use throughout mixed martial arts, and some are not. For me, the importance lies not in these specific strikes and blocks, or any movement, but in the fact that China still has martial artists who not only talk about creating useful systems, but actually set them down on paper, train them, and pass them on. If you would like to learn more about Li Quan or 36 Elbows, head to Kungfu Family.